Coach's Corner - Amelia Earhart hand signed FDC cachet. Go Back to Lot List Amelia Earhart hand signed FDC cachet. 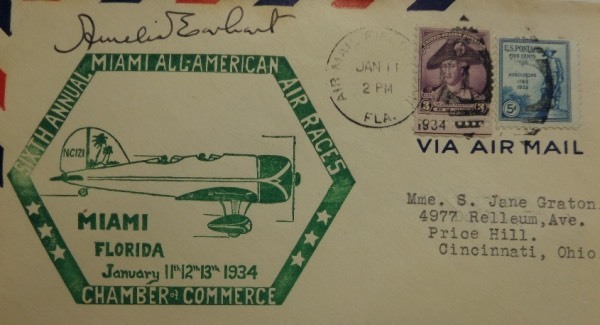 This super high value Great American investment piece is a dated, stamped and cancelled First Day Cover, comes dated from 1934, and is ink signed by the lost air star. She has signed it in ink, grade all over is an honest 8, and it honors the famous Miami Air Races. Cool piece, sold with NO reserve, and a must have for all autograph collectors.